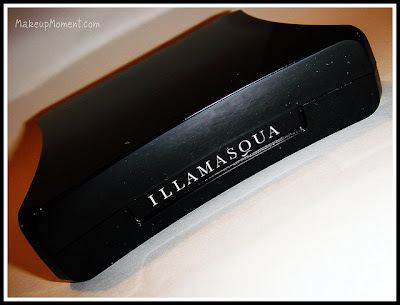 When I think of Illamasqua, high pigment and quality come to mind. I don't have many items from the cosmetics line, but what I do have-I love! 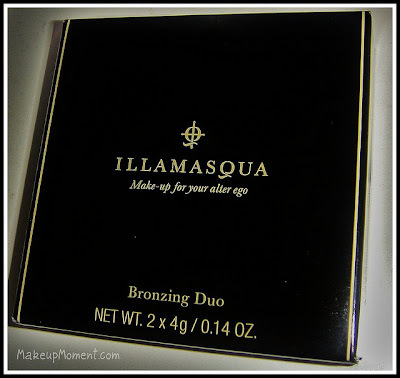 Since I seem to be going through a bronzer phase lately, it came to no surprise that I picked up the Illamasqua Bronzing Duo in Glint & Burnish ($30.00) while at Sephora a few weeks ago. 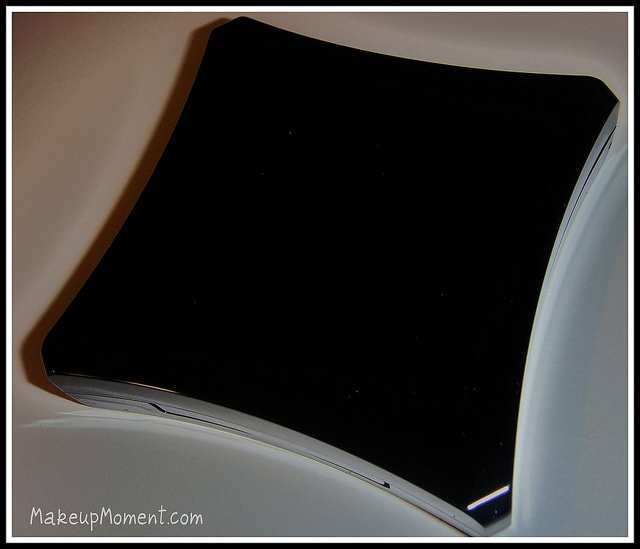 I can not say enough how much I am in love with Glint & Burnish! I have been using it daily ever since I got it. 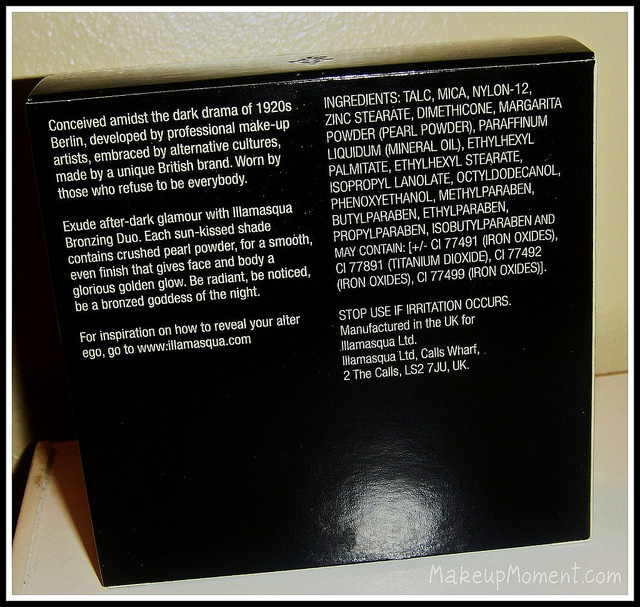 I love everything from the sleek packaging, to the superb product itself. 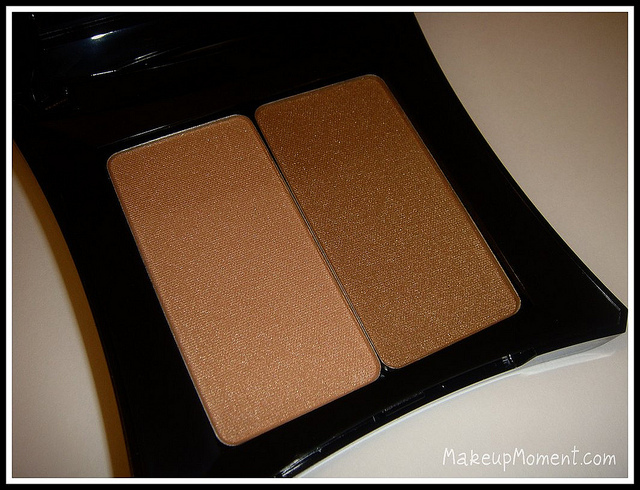 This duo contains two colors that work together to help give that bronzed glow most long to have. The color on the left side is a pretty soft peach, while the color on the right is a warm golden/bronze. I am happy to report that both shades are super smooth, finely milled, and feel like butter when I apply them on the cheeks. And both shades are easy to blend too. 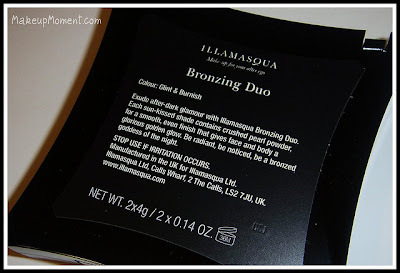 Although both colors "contain crushed pearl powder", what I find the most interesting about this bronzing duo is that although both colors contain the very fine, golden shimmers, they are not very prominent on the face at all! If shimmer isn't your thing or if you are worried about having shimmer overload, I promise you won't get that with this bronzing duo. All that is left is a soft, warm, natural looking glow that will last all day. No retouching needed here. Pigmentation wise, they both offer good color payoff-best of all, this duo does not go on orange.Score! 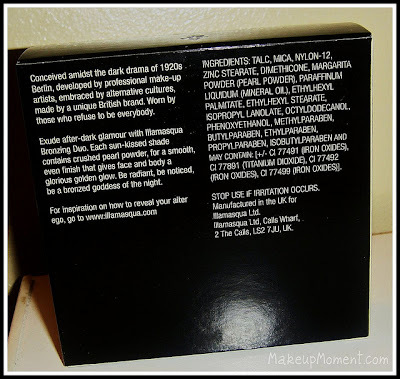 I would suggest using the darker color for all over the cheeks or contouring, and the lighter color to apply on the cheek bones or anywhere else you would normally highlight, to help give your face that extra luminescence glow. I think highlighters are a perfect finishing touch when it comes to applying bronzer. Or you can use the lighter color on it's own if you want a more natural look. 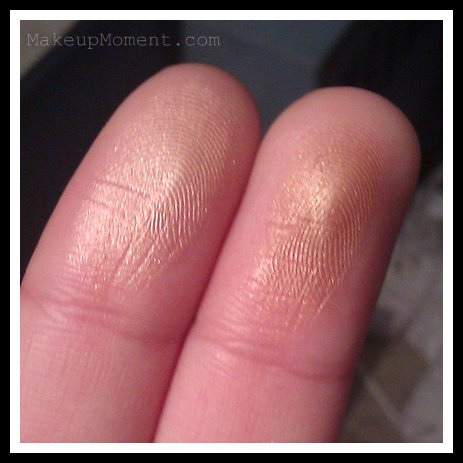 Check out Lilit's review of Glint & Burnish, in where she demonstrates how it looks on the cheeks. So pretty! What do you all think of Glint & Burnish? What are your favorite Illamasqua products? Let me know in the comments section, I would love to hear your thoughts! Glad I'm not the only one totally in love with this product, how fantastic is it huh! And thanks for the link to my blog hun. I love me some bronzers and this has me so curious. looks really nice. I hope you give it a try sometime. I am sure Glint & Burnish will not dissapoint :) What are some of your favorite bronzers?